The Illinois Electronic Security Association actively engages in consumer and industry advocacy, promotes public safety and fosters positive relationships with police, fire and elected officials at the local, state and national levels. Regular Members are business entities licensed by the State of Illinois (225 ILCS 447/) as Private Alarm Contractors or Private Alarm Contractor Agencies that agree to conduct business in accordance with the Association's Bylaws, Code of Ethics and Anti-Trust Policy. Major business activities include installation, service or inspection of burglar alarm, fire alarm, closed circuit TV, access control, alarm monitoring and all other security services. To promote the mutual interests of the electrical protection industry. To foster cordial relations among the members. To use all lawful means as a medium for exchange and dissemination to members and the public, of information applicable to the field of Burglar and Fire Alarms, Closed Circuit TV, Access Control Systems and all other electronic security services. To be guided always by a spirit of justice and honor in all business activities and that all members observe the Association Code of Ethics at all times. Through cooperative effort, to engage in or conduct lawful activities which benefit the interests of the Electronic Security Industry. March 1980 Under President Robert Bonifas, who later served as NBFAA's President from 1986 - 1988, CAAA became the Illinois Burglar and Fire Alarm Association (IBFAA). 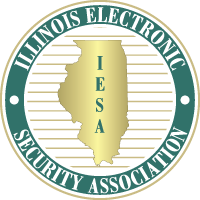 August 1992 To more accurately reflect the spectrum of the industry, IBFAA adopted its current name, Illinois Electronic Security Association (IESA), under President Jerry Robinson.